New York (CNN) -- Certain groups of die-hard fans are protective of the characters they hold on a pedestal. "Star Trek" has its Trekkies and "Star Wars" has the Jedi religion. Sherlock Holmes has the Sherlockians, scholars of the canon of books and short stories written by author Sir Arthur Conan Doyle. Many Sherlockians are members of the invitation-only literary society, The Baker Street Irregulars. Group members have historically been critical of on-screen adaptations of their beloved consulting detective and his faithful sidekick, Dr. John Watson. While they, by nature of their adoration, saw flaws in the Guy Ritchie "Sherlock Holmes," which opened in theaters Friday, the consensus among these experts was that the film is a fun -- and even occasionally faithful -- romp through Sherlock lore that the author himself would have enjoyed. "I liked it a lot more than I thought I would," said Andrew Peck, a United States magistrate judge. "What I particularly liked was the Holmes-Watson relationship. The movie really showed Watson as a trusted companion to Holmes, coming to Holmes' aid in times of need. The Watson of the books is a military man who played rugby and sports in college. He is tough. He is observant on his own and Holmes wants him around, not as a bumbling fool but as a trusted aide." Watson has historically been portrayed in films as a bumbling sidekick, most famously by British actor Nigel Bruce in a series of films from the 1940s. But director Ritchie's imagining of Watson is as the quick-footed, sharpshooting contemporary of Holmes, with a rapier-sharp wit that can match the detective in the tongue-lashing department. "The movie did an excellent job in portraying the relationship between the two. The actors work well together, as did Holmes and Watson. The movie shows Watson as intelligent, able to be a good assistant; Watson, the doctor, concerned about his friend's well-being; and it shows his reasonable frustration with his friend's often thoughtless ways," said Julia Carlson Rosenblatt, a Baker Street Irregular since 1981 and co-author of "Dining With Sherlock Holmes." Doubleday editor Christopher Morley founded the Irregulars in 1934. The group has included mystery writers Rex Stout and Anthony Boucher and science fiction writer Isaac Asimov. Honorary members have included presidents Harry S. Truman and Franklin Delano Roosevelt. 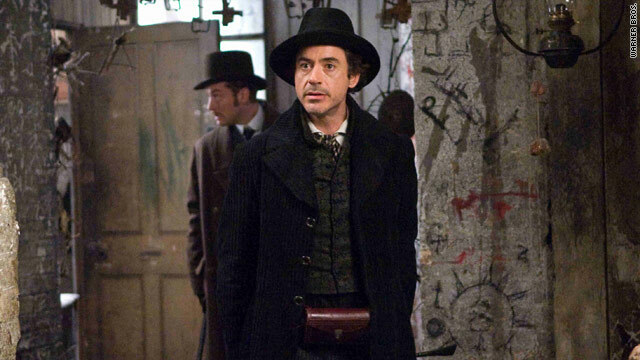 The plot of the new Sherlock Holmes movie, starring Robert Downey Jr., as Holmes and Jude Law as Watson, isn't based on an actual Conan Doyle story. The action centers on ritualistic murders and black magic, all leading to a case that has all of London in danger. Peck saw "Sherlock Holmes" at an early screening of the film on Tuesday in New York with a dozen other Sherlockians. Peck has been a member of the Baker Street Irregulars for 37 years, but has been a lover of the Holmes detective stories since he was in junior high. "Certain lines of dialogue were lifted the from the books, which we as Sherlockians enjoyed. They got laughs from the 13 folks in the theater who were familiar with the stories, while everyone else was quiet. Other than that, it was all made up except for bringing in certain character names and the supporting characters," Peck noted. Because they are so familiar with the entire canon of four novels and 56 short stories written by Conan Doyle, Sherlockians naturally nitpicked some minor details. For instance, in this film, Watson introduces his fiancee, Mary Morstan, to Holmes for the first time. "But we know Watson met Mary Morstan because she came to Holmes for help in 'The Sign of Four.' Holmes already knew her," Peck explained. And Holmes' love interest in the film, Irene Adler, the con woman played by Rachel McAdams, was in only one of Conan Doyle's stories, "A Scandal in Bohemia." "While she was called an adventuress in the story, she was not a criminal by any means, as she is portrayed in this movie," Peck said. Conan Doyle himself would have appreciated the newest on-screen display of his hero, says Albert Rosenblatt, a Baker Street Irregular and retired appeals court judge. "So if this portrayal is a combination of Holmes, James Bond, Indiana Jones and Spider-Man," he added, "it just rolls along with the times and with the current film genre dominated by brilliant, spectacular special effects, explosions, violence, and more explosions."